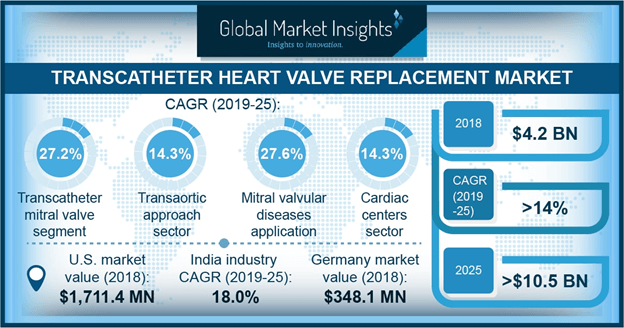 Transcatheter Heart Valve Replacement Market size is set to exceed USD 10.5 billion by 2025; according to a new research study published by Global Market Insights, Inc. Rising capital investment for the transcatheter heart valve devices by major market players is one of the primary factors augmenting the growth of the transcatheter heart valve replacement market in North America and Europe. For instance, Abbott laboratories; a global healthcare leader announced its investment in manufacturing of Portico transcatheter valve. Hence, venture capital investment in the production of transcatheter heart valve devices by major players in the healthcare sector will be a market driver in North America and Europe.